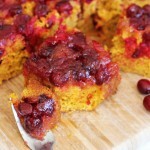 A delicious and moist upside down pumpkin cake, with brown sugar and cranberry topping! Lightly grease a 9-inch square pan. Pour melted butter into pan, covering the entire bottom. Evenly sprinkle brown sugar over butter. Evenly sprinkle the cranberries over the brown sugar. In a large bowl, combine eggs, pumpkin puree, and oil. Whisk until well-blended. In a separate bowl, combine flour and remaining ingredients. Mix until well-blended. Add the flour mixture into the pumpkin mixture, and stir until just combined. Carefully spread the batter over the cranberries in the pan. Bake at 350 degrees for 40-45 minutes, or until a toothpick inserted near center comes out clean, and edges are golden brown. Cool for 15 minutes on a wire rack. Place a large platter on top of the cake, and invert. Cool for an additional 15 minutes. Best served warm. Enjoy!